There are freethinkers, free spirits, risk takers, right makers, dreamers, and doers who are standing up to support Together, We Dream. Here is one story that explains why. 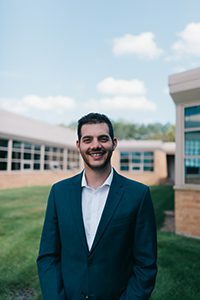 Meet Nate Bander, alumnus and MPA Upper School Admissions Coordinator. My family has been part of MPA since 1996 and we’re passionate about MPA’s continued success. Completing Together, We Dream will continue to ensure that MPA students for generations to come have access to the same incredible facilities that our family has had. Both Together, We Dream and the MPA Fund are incredibly important. For me, as someone who fully supports MPA in any way I can, it’s critical to contribute to both this year. Obviously, Together, We Dream is a historic moment for MPA and will change our campus forever, but the MPA Fund still provides funds for financial assistance and day-to-day operations of the school that students, faculty, and MPA families can’t succeed without. For me, it’s a little bit more of an investment supporting both Together We Dream and the MPA Fund this year, but it’s all worth it because of how much MPA has impacted my family and me. Why do you choose to give to Together, We Dream even though you have graduated? An MPA education is a lifelong gift. Though we’re coming up on the 10 year anniversary of my graduation from MPA, I chose to give so that my future children will have a viable, strong MPA campus and community. Just like previous generations supported me, it’s now my duty to support those who will come next. The cornerstone of an MPA education is community. With the completion of the four priorities in Together, We Dream, MPA students will experience an increasingly close knit community with matching facilities and resources to facilitate a joyful student experience and a vibrant school culture. My dream is for MPA to be a strong, well supported institution that succeeds in the classroom and in athletics while educating the next generation of dreamers and doers in the best facilities possible. I dream of MPA hosting the Conference Championship Track Meet. I dream of MPA inspiring its students to create through cooking. I dream of MPA maintaining a beautiful new library that’s both cozy and practical. Together, We Dream works toward all of those dreams. I’d like to challenge the class of 2009 to have the highest participation of any alumni class. We were the beneficiaries of the brand new Lansing Sports Center, we saw the Nicholson Center open up, as fifth graders, we were there for the ribbon cutting of the new expansion and the purchase of the District 622 building. We have been lucky to benefit from previous generosity at MPA and now it’s our turn to give back through Together, We Dream.